The site was first inscribed in 1994, and extended in 2000 to include natural criterion (I). Between 8 and 9 in the morning, you'll see dozens of minibuses plying the streets of Hanoi. They are picking up their passengers for a tour to the famous Ha Long Bay. You'll see the same minibuses over and over again when driving the 3.5 - 4 hours to Ha Long, and the same tourists will be on your boat or the one next to it. Ha Long Bay is an extremely popular destination both for foreigners and Vietnamese: already in the early 1990s it saw over 1 million visitors a year. It is unlikely that that number has decreased over the years - so there will always be about 3,000 other people in the Bay at the same time as you! I visited just a week after the fatal accident that killed 12 people here on an overnight boat. Traffic seemed to have resumed as normal. Overnight stays are also possible again, some of my group went on to stay for 1 or 2 nights on the boat. I opted for a daytrip only: not because of the accident, but also since I usually get bored pretty quickly looking at "natural beauty". And I had heard bad reports about life on board of the ships: I knew that I had made the right decision when I overheard the guide speak to the others about the evening programme that would constitute of "drinking and karaoke". The natural beauty of the Bay lay hidden today under a very common fog. As I had already seen the similar karst landscape at Yangshuo/Guilin in China a couple of years before, I cannot really say that I was blown away by it. We went onto one of the islands to visit the Surprising Cave - an indeed suprisingly big and beautiful cave with three hollow chambers. We saw some monkeys here too, just outside the cave exit. Part of the tour also was half an hour of kayaking - enough to paddle a full circle around the main area. The views from the kayak I found much more impressive than from the larger boat: you're so tiny then and the peaks rise sharply in front of you. I had a better look at the water too, and cannot say that I saw pollution by plastic or other junk floating around (contradictionairy to most of the reviewers below). There is a thin layer of oil on the water in some parts though. And then it's time to get back in the bus to Hanoi, another 3.5 hours. It has been somewhat of an obligatory trip, to tick off the WHS. However, the tour was carried out well (good seafood for lunch) and I had a satisfying day. Ha Long has big problems - overcrowding, pollution, and an inconsistent tourism product. That doesn't take away from the beauty of the place but it does present some concerns. It's hard for people (myself included) to choose a boat to go on. None of the travel agencies actually own the boats they are selling you a place on. They work on commission and they get more commission from certain companies – so they’re the ones they’ll push. They also don’t really know whether there will be a place on the boat they are selling you. It’s entirely possible (and happens very often) that you actually just get on-sold to another boat without realising until it’s too late. I wish there was an easy way to guarantee a good time. That's hard, though. I think the tourism industry would benefit in the long term from working on improving their product and not ripping off the stream of tourists who will never come back again. Our guide pointed out to a pair of unusual rock outcroppings, mentioning them as one of the highlights of the cruise - the Kissing Rocks. Featured as the ticket image, the pair of rocks were actually unspectacular save for an illusion of a pair of rocks seemingly split down the middle. To the seafarers they may have been an important landmark, and to geologists, a good example to show the power of natural erosion. Pirates are of course no longer an infestation in the bay but people do live on the waters. The floating villages became one of the 2 stops for our ship, lending us an opportunity for some excitement. The wooden structures were anchored in the waters, and I felt barely a sway stepping onto the platforms. The young lady rower was one of the villagers and her life was spent mostly over the waters, being as familiar with the bay as we were with city blocks. In strong strodes she silently worked the oars, silent except for answering our questions or when pointing out an interesting spot. In short conversations, we got to know that she was in her teens yet her strength and skill of rowing a vessel with the weight of 7 belied her age. I have to agree with the people who complained about the pollution of this most stunningly beautiful area. Also we got the feeling that there was not much life there. We saw people fishing but saw no fish in the water ourselves in the two days we were on the boat. We never saw a bird either during that time. We wondered why it was so devoid of life? Bit off putting really. 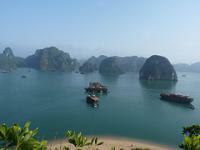 I visited Ha Long Bay as a side trip to a bicycle tour of Vietnam. We stayed overnight on the bay and took a kayak tour the next morning. The boat itself was first class and the service and meals on the boat were excellent. Unfortunately, it's my opinion that this should be taken off of the list of World Heritage sites. Why in one word: POLLUTION. Not only is the air so thick with pollution that it's difficult to see the beautiful limestone outcrops jetting out of the bay, the water stinks to the point where I was concerned about it splashing on me when we kayaked. It seems to me that the 100's of boats in the bay may be dumping raw sewage into it. What a terrible shame and truly an environmental disaster. The Vietnamese government is spending a bundle of money widening the roads and building a new port area so people will visit. Unless they also turn their efforts into cleaning the area up, they might as well leave the roads alone. Furthermore, from what I could see, it will take 15-20 years to clean this site up. Too bad-- the decimation of this site is impossible for me to understand. The water in the bay we kayaked to for swimming was extremely polluted (althought the small beached area was relatively clean. After swimming, my skin stung for the rest of the day. Maybe the sea is extremely salty...or maybe the little mounds of oily foam floating all over the water are a testament to who knows what chemicals being dumped into the bay. Just spent 2 nights/3 days on a junk in Halong Bay (April 2010), like some of your other reviews I to was shocked by the amount of pollution in this World Heritage area. The haze was described by the operators as mist and apparently is at its worst at this time of the year April/May. I would describe the 'mist' as smog and if the air quality in this area is as bad as the water quality in this beautiful area I would say this was a fair description. One of the days we visited a beach for a swim. The beach was so polluted by plastic bags, bottles, plastic bags filled with garbage and other flotsam and jetsam, there was no way that I would let my children swim in such polluted water. I found it amazing that the tour operator took us to this beach when it was in such a dirty state. My husband and I found it ironic that the operator didnt employ some locals to keep the beach clean - this could've been done at a minimal cost. Halong Bay needs to be cleaned up - on my return home I told people how beautiful the area is, but I also tell them about the pollution. Eventually tourists will be turned off and the main losers will be the tour operators and the locals who live in the floating fishing villages. "Va Gia "– Cua Van is situated at Hung Thang Commune, Halong City, 20km away from the tourist boat wharf, the fishing village lies in a calm bay surrounded by mountain. It's a stunningly beautiful site. As I always love water, it gives the best out of the site. The changing of shade of colours from the sky as opposed to the bay... the rocks of different size and forms... the misty fog as I went along a 4 hours sail from the port to one of the islands, and not a second was wasted.. The first time we visited Ha Long Bay was in February of 1999. We took a motorized, wooden boat from Hon Gai City all the way south to Cat Ba Island. The nearly 4-hour cruise afforded us visits to well-known caves and beaches that were prepared for commercial tourism. We were absolutely impressed by Ha Long Bay's unique and natural composition of over a thousand islands and islets. Though we encountered some floating merchants, we didn't observe any pollution from tour operators, merchants, or tourists. 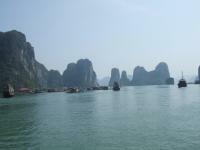 Recently in late December 2007, we had another opportunity to revisit Ha Long Bay. This time we decided to take just a one day excursion. The bus ride from Ha Noi to Hon Gai City was on better conditioned highways. However, the experience wasn't any better, due to an excessive number of automobiles, scooters, and just bad traffic in general. What I observed were too many tour operators, too many motored boats of all sizes, and especially too many tourists crunched into such a small welcoming area. Speaking of "welcoming," that was the feeling I least had when the bus dropped us off to board our boat. The feeling of pristine and wonder of nature was nowhere to be found until 5 minutes into the Ha Long Bay water. I was disappointed with the chaotic, unorganized, and unprofessional way of guiding visitors by the Ha Long Bay tour operators. I visited Ha Long Bay on a day trip from Hanoi in July 2004. It was very cloudy on the day I visited but the resulting mist made the islands in the distance very enchanting and I was able to take quite a few good shots from the boat I was on. Ha Long Bay is one of Vietnam's premier destinations and as a son of Vietnamese immigrants, I am very proud of this world heritage site. We were in Vietnam in December, 2005. 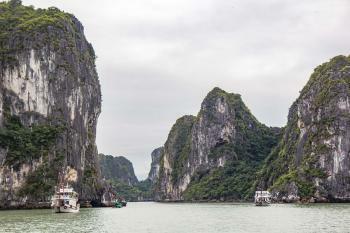 We did an overnight junk trip on Ha Long Bay and were thoroughly enchanted. Stunning scenery, and really quite a special place especially cruising through in the morning mist. We did not see any of the pollution that others have written about. We really felt like we were far from land-based civilization while we were out on the water. 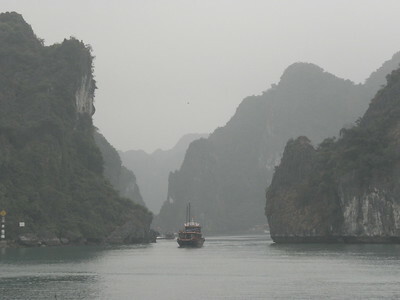 I have just returned from a trip to Vietnam which included 2 days on a traditional Vietnamese junk boat in Halong Bay. The site itself is breath-taking, but unfortunately, there is little respect for nature shown by those operating the tour boats. I repeatedly saw boat operators throw their garbage overboard into the waters. These are the people who survive on tourism and ought to care more about protecting the very site which is bring the tourists to them in bus-loads. It was sad to see this and I hope the government forces people to clean up their act. Archipelagos: (Erosion) "Although the name Ha Long Bay is often used to describe the entire area, it refers only to a section of a vast archipelago of thousands of limestone pinnacles stretching nearly a hundred kilometres from Haiphong to the east." Piracy: "As late as the 19th century the bay was used by Chinese and Vietnamese pirates"
Northern Vietnam Hotspot: About just doable to catch "public bus to Ha Long bay by yourself at Ninh Bihn bus station at 6h00 - 6h30 every day". There are also organized day tours.